Dulfish attends the weekly party at Riverview. 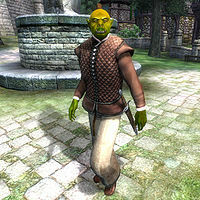 Dulfish gro-Orum is an Orc barbarian and the head of a local skooma-dealing ring in Cheydinhal. The other members of the gang are Magub gro-Orum (possibly his brother), Bazur gro-Gharz, Borba gra-Uzgash, who runs Borba's Goods and Stores, and Oghash gra-Magul, who runs the drugs to and the money from the local Camonna Tong representatives. Any more information is impossible to obtain, as all of the gang members except for Borba are unusually rude, even for Orcs. The first time you try to talk to Dulfish, he will reply with the subtle "Get lost. Or I'll pull your arm off." The next time, he'll reply with, "You don't listen? You stupid? Crot. I'm wasting my breath. Then go ahead. Stand there. Talk all you want. You're a fly. Go ahead and buzz." 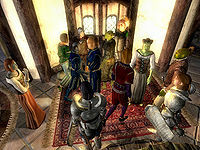 but will at least let you ask about Cheydinhal, to which he will politely respond, "Look. A fly. Buzz, buzz. Hey. Look everybody! I'm talking to a fly! Buzz, buzz, buzz!". After that he will only ever say "Buzz, buzz, buzz. Go away, little fly." He shares a house with Magub gro-Orum and they both sleep in the upstairs area. Dulfish wakes at 8am and takes a walk for four hours around the southwest of town, near Willow Bank and the house for sale, building up an appetite for his lunch. He eats for two hours at midday in Newlands Lodge before heading out once more at 2pm. This time he takes his walk a bit further north, closer to the shops and inns of town. On most days, at 6pm he heads back to his house and stays there until 8pm when he heads back to Newlands Lodge for his dinner. He stays there until 10pm and then heads back home once more, where he potters about until 2am at which point he goes to bed. On rainy days, Dulfish will cancel all his outdoor activities and stay inside the house. Dulfish is one of the select group invited to Riverview each Loredas. He heads to the party at 6pm and stays until midnight, eating between 8pm and 10pm. After leaving the house, he resumes his usual schedule. Dulfish wears a middle-class outfit consisting of a quilted doublet, light brown linens, and a pair of quilted shoes. He wields a steel shortsword and a steel dagger, and carries his house key as well as a small amount of gold. Esta página foi modificada pela última vez à(s) 05h25min de 20 de outubro de 2015.